History… and we are not part of it! Microsoft chairman Bill Gates and Apple CEO Steve Jobs sat down together for an interview at the fifth annual All Things Digital Conference to talk about technology and what the future holds! This is historic because (i) those two are arguably the most important people in the (proprietary) computer business and (ii) they publicly spoke together only twice before. The full transcript can be enjoyed here. Unfortunately, I couldn’t watch the videocast because the connection speed detected will cause a potentially unviewable experience! This is crap! We are in 2007. I am paying lots for my 256kbit/s MyT Internet connection and I can’t watch an historic video!!! And I’m sure I’m not alone in Mauritius in this situation. Bill Gates: You know, take what can happen with education now that video is mainstream and all these tools that let you do rich interactions are very mainstream. I’m very excited about that. You know, the idea of empowerment goes back to the very beginning of our industry and some of those dreams that this would be used by students or that teachers could get better and learn from each other in these new ways, we’re just at the threshold where some of those things can happen. Ha! Ha! Ha! He should come to Mauritius and look at what kind of bandwidth we are getting even though we are paying for a lot more. I’ve done a small test. I’ve downloaded a song I composed from noulakaz.net which is found in the USA. The song is 4,276,087 bytes long and downloading it took 6 minutes and 5 seconds. According to my calculations, this is a download rate of 88 kbit/s. Now, this is only 35% of the 256kbit/s that I’m paying for. Can you imagine this kind of abysmal ratio in any other situation? What about a lecturer doing only 35% of his classes? Or a doctor healing only 35% of his patients? Or a fridge working during only 35% of the day? Mauritius Telecom is pathetic. And the more I think of it, I think we might have a strong case against MT for product defect. I laugh because I know how frustrating it can be when one is stuck with a slow connection. It has such a huge [negative] impact on productivity. If only the government could see how strong a case that is — impact on productivity. You are lucky to be living in a country where bandwidth is plentiful. I fully understand that this is not possible here because of the costs involved. But I don’t want to pay for only 35% of what I’m supposed to get! You have a point. We need to start complaining more vocally. I know some journalists. I’ll try to think of something coherent. Give me some days. Indeed MyT is crap. I moved from the normal 128 Kbs Wandoo ADSL to MyT last year thinking that I’d get better speed and have the Digital TV decoder. But I’m sad to say that while I could view video and radio streaming with the 128 kbs Wadanoo I can’t do that with MyT. As usual MT has lots of excuses for this appaling service, mainly that I’m far from the exchange. What I find disgusting is that they want to sell us Video on demand which I’m sure nobody cares about but are not able to provide decent connections for the price we pay. Avinash, that’s a very paltry connection of yours. I remember when I subscribed to MT’s ADSL Wanadoo 128 in mid-2005 at a time when I could surf the net at the full and puny speed of 12-13 KB/s all day long. Now, I can barely download files during the day. It’s painful at peak hours to even check your mail. I’m not of those brainless teenagers and young people downloading movies and other crap mature content all day long. 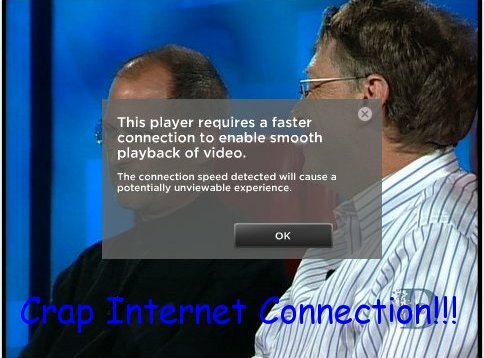 Bandwidth is something too precious to waste. To Avinash: Did you get your MacBook from from repairs ? I got my MacBook after two weeks. They replaced the faulty hard disk and the top part (i.e. the keyboard, trackpad, etc) free of charge. Incidentally, I’ll be buying AppleCare in a few weeks to get 3 years of additional warrantee. We really should do something about that. We should push the authorities here in Mauritius into reviewing how internet is diffused in this country. We should stop paying over the odds for such crap service. What if we all cancel our broadband subscriptions in protest ? I’d be prepared to do that if I could have the guarantee that these policy makers are gonna look into drastically changing how they do business. Hmm.. what you seem not to realize is that MYT seems to be the best service provider right now compared to the rest in mauritius. using ADSL 128 of telecom plus was my worse experience i ever had with sometihng called SLOW CONNECTION.. that was damned slow, i had been paying for a 128kbps connection, i was supposed to be gettign a download rate of around 13.3kB/s on average, but on average i was getting 2kB/s and i think they were doing it on purpose to sell bandwidth somewhere else probably. Now with MyT, i am getting abount at lowest 14.4kB/s and maximum 112kB/s (when i have not exceeded my 1GB.. which was exceeded o nthe first day itself), on average i get around 30kB/s which really isn’t bad, the enemy isn’t mauritius telecom, mauritius telecom is trying to atleast do something better, , the real enemy is telecom plus, i was sooo frustrated with my previous adsl 128 internet that i was always with a bad temper at home, i broke 3 CDs out of frustration (i regret now.. i lost splinter cell), i broke one glass pane (i have to pay and place it now), i got a fight everyday with my dad (you simply can’t stay yourself when you someone is telling youto come to eat while oyu are waiting for something important to load). In those days, one Telecomplus worker approaching my house could have been badly tortured.. and i am not joking.. frustration was high cozo f their crappy connection. As a MacBook owner, I strongly recommend AppleCare because both you and I bought the first generations MacBooks. Check if you can get the faculty member discount. Sorry to dissappoint you, but you won’t get an additional 3 years, but 2, which added to the standard 1 year warranty will total to 3 years warranty. Actually, you can download/subscribe to any free podcasts from the iTunes Music Store irrespective of your country! You cannot however purchase tracks due to copyright limitations and label agreements. Alternatively, I may have to use P2P to get it…but then I suspect MT is doing traffic shaping to limit usage of P2P transfers. Some great free tutorials/podcast! An easy way to learn about new software for OS X! The file is about 1GB and on my ADSL 512k, I got only 36MB in 4 hours! Telecom plus has been giving such types of service lately, that’s why i shifted from telecomplus to myt. Actually.. i think telecomplus is making people frustrated for a reason.. there must be some marketing behind this… probably forcing ppl to shift to myt? but why? I wonder till when Mauritians will bear this… but anyways, those who have always been stuck with their dial ups will just see the ADSL speed as amazing, they won’t even care looking whether the connection is as they have paid for… How would you make them realize that when they just have just understood how to click, double-click? I wonder if the grass is really greener on the other side…So far, I haven’t heard only positive reports about MyT’s ‘impressive’ bandwidth. I’m not totally convinced my issues will be resolved if I switch to MyT. Some interesting comments here. I’m not sure that MT have a policy of making customers switch to the MyT product, although I could certainly see why they could want to do this. It gives them the possibility to sell their VOD and telephone value-added services to you. The problem may be that Business customers are given preferential QoS. Do you notice speed increases during the night when compared to daytime usage? Also what I will say is that a Download Manager made a significant improvement to my download speeds. That is not so good. I’m currently (21:03 9/6/07) getting 22.9kB/s using apt-get to ubuntu repos in the US. It should be in the region of 40-50 but I have patchy wireless reception. My room is quite far from the AP with lots of concrete and metal in between. If I hold the antenna in the “right” place, the speed shoots up to 40kB/s. I’ll try to run some “proper” experiments, a bit later. This is using a 512kbps Wannadoo ADSL connection. Hurray! Uploads are quicker than downloads!